The Intermediate Sherry, which came/comes in a truly monstrous box (in terms of size and aesthetics), was one of Amrut’s very first complicatedly matured whiskies (I think the even more complicated Kadhambam was released around the same time–though it took longer to come to the US). As per the press release the spirit was matured first in ex-bourbon and virgin oak casks then in sherry casks and then finished once again in bourbon casks. It’s not clear how long each stage lasted. (As an aside, four of the six people whose approval is cited in the press release are/were putative amateurs; more evidence of how important amateurs are to the industry’s marketing.) It was a very successful release and paved the way for the Portonova which was matured in a similarly complicated way. I quite liked it when the bottle was on the go (which is when this large reserve sample was put away) but didn’t feel it was so very different from more conventional sherried whiskies or that the quality quite justified the price (it hit the ground in the US at $119.99 or thereabouts). Of course, since then non-cs (but age stated) whiskies like the Yamazaki 18 have become even more expensive and even the Highland Park 18 is above $100 in most US markets (to name only two of my favourite sherried whiskies). Let’s see what I make of it tonight. Nose: Rich sherry with a twist: instead of the usual raisins and caramel it’s cloves, leather and something herbal that makes the first impression. Behind that there’s some orange peel and also some other muskier fruit. A hint of mocha/chocolate as well. Quite expressive at full strength. The fruit come to the front after a couple of minutes and now there’s caramel and also the powdered ginger I often get in Amrut. There’s a medicinal note as well–not in the Islay peat/iodine sense but something reminiscent of these brown tonics we used to be fed by the spoonful as kids in India. Gets much brighter with water (lemon) but also spicier (cinnamon) and just a little bit savoury (reduced stock). With a lot more time (40 minutes after it was poured, 15 minutes after water was added) it becomes much conventionally sherried (reminiscent now of a PX matured Glendronach). Palate: Citrussy and then sticky sweet–raisins, plum sauce–but rather hot at full strength. On the second sip the wood is more apparent–polished, nothing tannic–and it’s much more citrussy (lemon peel) now. Some salt appearing late. There’s certainly something kids’ tonicy/syrupy about it but tonight, at least, I’m liking it. Gets fruitier as it goes. Water brings out some bitterness and also a little more salt but the lemon remains. Finish: Long. The fruit lingers as does the salt, and there’s a ginger/mocha/chocolate thing too. The bitter edge shows up on the finish too with water but it’s not offensive. Comments: Well, I think I like it more tonight than I remember doing. And I have to say that tonight I think it’s quite different from conventionally sherried malts. And while I am revising things I have said earlier, I will also concede that this does seem like a much older whisky than it is–blind, with water added, I would probably pick it in the mid-high teens. The nose in particular is rather nice with a perfect balance of richer, darker sherry cask notes and the brighter fruit from the bourbon maturation. And that powdered ginger note works really well here. The palate is not quite at that level but is quite good too, especially with water and a lot of time; the finish is the least interesting part with little development. I’m going to turn around now and say that around the $100 mark this is a pretty good deal and probably justifiable at the $120 mark too. 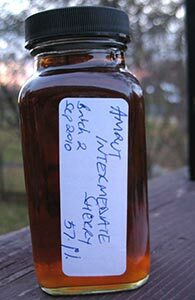 This entry was posted in -Whisky by Rating, 85-89 points, Amrut and tagged *Whisky, India, Sherried, Single Malt. Bookmark the permalink. its a quality bottle from a quality distiller so i have no gripes over giving them $100 of my money, or however much they actually get from the distributor. It would be hard for me to pass up an abunahd at $75 for another bottle of intermediate sherry (if i could find one), but would buy this bottle every time over a macallan 18 and feel good about it. Yeah–the problem with A’bunadh is you might get a batch that is as good or nearly as good as this at a lower price, but you might also get a batch that’s just middling. That said, I do agree with you that if a big sherried whisky is what you are looking for then there are other, cheaper options that will make you just as happy. But this one (and the Yamazaki 18) has qualities that many other young sherry bombs don’t. Where it gets hard for me is if I think about picking between this and, say, a single cask Glendronach in the high teens. The bitter chocolate, leathery, earthy notes of those are not very pronounced here on the palate and finish. Great review with superb tasting notes. Quite nailed it, really. As it happens, it was on sale in Minneapolis recently and I picked up another bottle for just about $100. It’s a different batch (#4, I think) so I’ll be interested to see how it compares–still have four ounces of this one left.